﻿Alligator gar is the misunderstood "big daddy" of freshwater fish. Ten years ago, that message landed in my email box at Texas Parks and Wildlife Department headquarters. It was my first hint that our biggest freshwater fish was starting to get some respect. Four species of gar swim in Texas waters. The alligator gar, Atractosteus spatula, is the granddaddy of them all. It can grow longer than 8 feet and weigh more than 300 pounds. Tough, interlocking scales and a snout full of sharp teeth give it a prehistoric appearance. Scientists believe this species has survived largely unchanged since the days of the dinosaurs. Once viewed as a “trash” fish by a large segment of the sport fishing community, the alligator gar has been getting an image makeover. Feature spots on Animal Planet’s River Monsters and other outdoor shows have led Texas residents and visitors to seek close encounters with the big fish. Resource agencies that spent decades treating “gator gar” as a nuisance species are now talking about conservation. “It’s a unique fish, a misunderstood fish, and it’s had an unfounded bad rap,” says Dave Terre, chief of fisheries management and research at the Texas Parks and Wildlife Department. Texas is a key player in this changing game: it’s one of a few states that still have healthy populations. 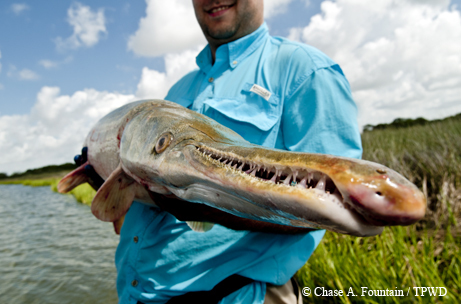 Alligator gar have declined in or disappeared from much of their historic range. In September 2009, TPWD took the precaution of putting a one-per-day bag limit on alligator gar. At the same time, the department placed a priority on alligator gar research. It’s a long-lived species, quite different from the black bass and catfish reared in Texas hatcheries, and since it wasn’t a high-profile game fish, it never had been studied much. To manage alligator gar for recreational fishing, we needed to know more about what makes them tick. Department biologists have conducted a dozen studies so far, with more in progress (or in the planning stage). They’ve sampled populations in five river systems, tagged individual fish and recorded their movements, and worked with gar anglers to learn how they use the fishery. Along the way, they’ve figured out which sampling methods work best and fine-tuned techniques for estimating a gar’s age by using ear bones and fin clippings. These techniques will assist future research, here in Texas and elsewhere. Here’s a sampling of what we’ve learned. One factor that feeds the gator gar’s “nuisance” reputation is the widespread belief that it eats up the game fish that license-buying anglers prefer to catch. Results of diet studies suggest that’s not the case. Last year, TPWD biologists analyzed the stomach contents of 392 gator gar collected at Falcon Lake on the Texas/Mexico border and found carp, tilapia and shad. Game fish made up 20 percent of what the gar had consumed, with largemouth bass accounting for only 8 percent. Studies at six other Texas reservoirs, dating back to 1970, showed even smaller percentages of bass in the gars’ diet, and there’s no evidence that the big fish are having a significant impact on bass populations. Terre notes that many of the state’s best bass lakes — Falcon, Choke Canyon, Sam Rayburn and Toledo Bend — have robust populations of alligator gar. How many alligator gar can anglers take out before a population goes into irreversible decline? It’s not an idle question, given what has already happened in some other states. 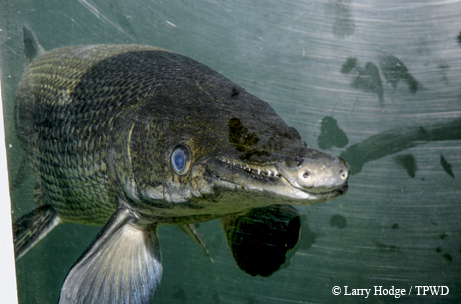 To find the answer, biologists needed to understand the gator gar’s unusual life cycle. Alligator gar live a long time and take decades to reach trophy size. A 7-foot fish could be 40 years old. The world record, caught in Mississippi in 2011, measured 8 fee 5 inches and weighed 327 pounds. TPWD researchers examined ear bones from that fish and estimated its age at 95 years. It takes 10 years, on average, for gator gar to reach breeding age. They require certain conditions for successful spawning, and those conditions don’t come around every year. Researchers did age analysis on more than 100 specimens from the Trinity River and used the data to estimate the shape of that population. Fish in the sample ranged from 2 to 47 years old, but there were gaps in the age distribution. “Results suggest that no reproduction occurred in 17 of the past 47 years,” reports Dan Daugherty, a research biologist at TPWD’s Heart of the Hills Fisheries Science Center. We know the gar typically spawn in April and May, congregating in shallow water. Rivers that rise in spring, flooding weedy areas in backwater tributaries, are ideal for this purpose. Checking results against weather records, the Trinity River researchers confirmed that the years of highest reproductive success coincided with good spring rains. As most Texans are aware, spring rains have been unreliable in recent years. The last big spawn on the Trinity occurred during the unusually wet spring and summer of 2007. Short-lived fishes like white bass and crappie can lose up to one-third of their adult population each year and still recover, if lake conditions are right. Some of our hunted animals can also thrive with high harvest rates. Wildlife managers in some areas recommend removing 20 to 30 percent of the white-tailed deer herd each hunting season, just to keep numbers in sync with the available food supply. With alligator gar, an overfished population could take decades to recover. Using the best data available in the early stages of its research, TPWD developed a model to project population changes at various levels of mortality. The model indicated that a 5 percent harvest rate was sustainable; more than that, and populations would start to decline. So, are Texas gar being overfished? Population and harvest data from around the state indicate we’re in good shape so far. Most waters have healthy populations, and we’re seeing harvest rates of 1 to 4 percent. TPWD biologists will keep an eye on that trend. As we learn more about different populations, it may be that bag limits can be loosened — or made more restrictive — in some areas. But Terre says we’ll never see limits of 25 per day like we have on catfish and crappie. A 2012 angler survey showed that approximately 14 percent of Texas anglers fished for gator gar at some time during the year. That’s nearly 123,000 people fishing for them with bows, rod/reel or trotlines — all legal methods for taking nongame fishes. It turns out they aren’t easy to catch. TPWD researchers followed bowfishing tournaments on the Trinity River in 2009, 2010 and 2011, and kept statistics on the catch. On average, they found it took 50 hours of effort to bag one gator gar. A study at Choke Canyon Reservoir yielded similar results. At Falcon Lake in 2014, only 29 percent of anglers surveyed said they “always” or “frequently” caught a gator gar when they went looking for one. Some gar anglers enjoy the challenge of seeking and finding a fish whose habits are still not well understood. “There’s a pretty good talent involved in catching them,” says Dawson Hefner, who guides gar fishing trips on the Trinity River. Some anglers are excited by the chance of a huge trophy. And some, particularly in the Falcon Lake area, take their gator gar home to eat. Not every gar fisher wants to keep what he catches. Hefner’s customers use rods and reels, and fish are released close to where they’re caught. Soele, who promotes the bowfishing experience, admits he doesn’t do a lot of shooting on his own behalf. How Do Gar Live in Their Habitat? Alligator gar are known to inhabit large rivers, tributaries, reservoirs and backwaters. They also turn up in coastal bays and estuaries. Recent surveys suggest this isn’t just an occasional thing. On the lower Trinity River, the 112-mile stretch between the Lake Livingston dam and Trinity Bay, researchers tagged 51 fish with ultrasonic transmitters and used telemetry to follow them for 22 months. They made note of when the fish hung in deep water, when they moved into shallows and how far they traveled during the study period. Most appeared to have home ranges of less than 40 miles. Scientists think the river may contain distinct groups of gar that don’t mix much. They did find that the downriver group migrated into Trinity Bay in late spring. Could they be finding spawning ground in the shallow waters of the bay? Coastal Fisheries biologists have collected more than 24,000 alligator gar from our bay systems since 1986. A new study will take a fresh look at the data on those fish. There’s still a lot we don’t know about this ancient fish and what it needs to thrive in a changing world. But we know much more than we did five years ago. TPWD plans to continue the research, and will share what it learns with fishery managers in other states and Mexico. 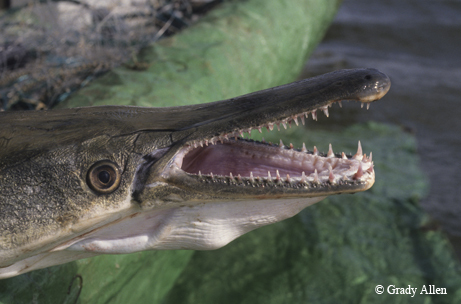 People who fish for gar will play a big part in preserving the species. To Dave Terre, it’s OK if an angler wants to eat his gar, mount it and hang it on the wall, or snap a photo and let it go. Those are all ways of respecting the big fish. He just hopes we’re getting past the days when people killed them just for being ugly.